Don't ask this alien emissary to cook dinner! 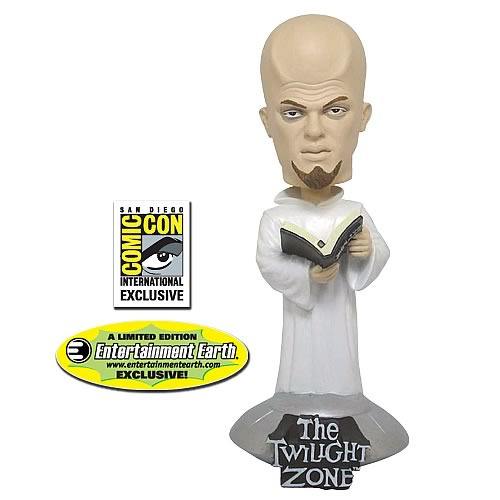 SDCC Exclusive color variant of The Twilight Zone's covert Kanamit. Wobbler based on the episode "To Serve Man." Limited edition of just 504 pieces from Bif Bang Pow! Entertainment Earth Comic-Con San Diego 2010 Exclusive! Based on The Twilight Zone's rather disturbing "To Serve Man" episode from 1962, this remarkable color-version bobble head from Bif Bang Pow! presents The Kanamit, a considerably covert character set on adding mankind to his menu of delectable dishes. The alien emissary is incredibly and authentically detailed in 7-inch scale, holding his "cook book." Buy him, admire him, but don't invite him to cook dinner! Limited edition of 504 pieces.